Lady Roma issued at same Mellow records in 2008 is another worthy and captivating offer from their catalogue. Keeping the same attitude as on Transizione (the only album I know besides this one) so far, but definatly want to check out more of their music because I like a lot what I've heared on this two releases. With , now more shorter pieces and more in number, only title track, the opening is little lenghtier around 9 min, the rest are between 2 and 7, but is not a problem at all, Doracor manage once again to capture my attention, big time. Very nice, elegant symphonic prog with lot to offer, both on instrumental sections as on vocal departement. This album can be consider as a detication of Corrado Sardella main man of the band to Eternal City - Rome, his own town. Some highlits here like title track or Roma Dei Misteri, very strong musicianship and elaborated instrumental parts, really like this kind of symphonic prog. The voice of Milton Damia is great, one of the few italian singers I know who doesn't have that specific accent when sing in english, really nice smooth voice. Ian Mosley the famous drumer of Marillion appear here besides othe rinvited guests. LUsh keyboards in interplay with the guitar parts makes from this seventh release from Doracot a worthy listning. 4 stars again, very strong band that is far less known then other acts from this country, they need for sure a wider recognition because they worth it. The eighth album from this Italian symph prog band. Doracor has had a very fine development from the rather paltry one-man band album The Long Pathway to this album, a full band album with a lush sound. Doracor has been a full band now for a long time. The difference in quality is huge. Lady Roma gives us fifty minutes of lush, elegant symphonic prog with Italian vocals. The sound is a mix of the English and US symphonic prog sound. Mostly the US sound, in fact. That means monumental elegance takes the front seat here. Monumental elegance produced with plenty of keyboards, guitars, bass, woodwinds, drums and very elegant male vocals. A bit sweet, perhaps too sweet, but still with a lot of substance. On this album, Corrado Sardella, the mainman in Doracor, has also included some influences from the likes of Rush, lounge jazz and soul. Yes, there is a big thick well known Rush riff in one of the songs here our friends has "borrowed" from our Canadian friends. I guess with tongue in cheek. It is fun listening to it, anyway. There is no real great tracks here and that is my main gripe with this fifty minutes long album. It is still a very good album well worth checking out. Fans of symphonic prog should have this album in their collection. Analysis. In his over twelve years of activity as a progressive rock musician, Corrado Sardella seems to have learned a very important lesson: one-man bands, no matter how gifted a musician one can be, will hardly ever be able to replace a real band in terms of delivering the goods. 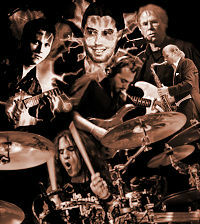 After his somewhat tentative first recording efforts of the late Nineties, Sardella started employing an increasing number of guest musicians, some of whom have become steady presences on his albums over the years – a winning move reflected by the steadily growing level of his releases. Here, finally dispensing with electronic drums (in so many cases the kiss of death for an album) has given the album a richer, more organic sound – we finally get the impression of a real band, not just a collection of hired hands to provide a backing for the main man. The album is meant as a tribute to the Eternal City of Rome (my home town, as well as Sardella’s), represented in the title and on the cover as a beautiful woman. In spite of that, my personal impression is that it does not sound as distinctively Italian as other recent releases from Italian bands. Rather than the legendary Italian prog outfits of the Seventies, the main sources of inspiration here seem to be bands like Camel, Genesis and Marillion. While a certain Mediterranean lushness can be occasionally perceived, on the whole there are very few elements that anchor the album to the Italian musical tradition: the Italian-language lyrics, as well as the occasional use of the mandolin, courtesy of long-standing Doracor collaborator Riccardo Mastantuono. Corrado Sardella is first and foremost a keyboardist; therefore it will not come as a surprise that the album is quite strongly keyboard-oriented. However, all the instruments involved in the recording of the album work together smoothly and seamlessly, as reflected in the open, airy nature of the music. Melody is the name of the game – nothing here sounds strident or overly cerebral, and the tracks blend into each other with a pleasing, natural flow, at times uplifting, at others somehow tinged with sadness for things that have gone forever. This wistful, melancholy quality is complemented by the autumnal beauty of the pictures in the booklet. One in particular deserves a mention – a breathtakingly beautiful, lavender-hued shot of St Peter’s Basilica taken at the twilight hour from the best possible vantage point, the majestic Ponte Sant’Angelo on the Tiber. The album opens with the title-track, a mini-suite in four movements introduced by a rather unusual passage recited by the soothingly deep voice of Daniele Si Nasce, mainly known for his activity as a one-man tribute to Roman-born singer-songwriter and showman Renato Zero. The lyrics, written in the Roman vernacular, are a paean to that ‘vanished Rome’ which has been the subject of many paintings, and as such sharply reminiscent of another famous song dedicated to the Eternal City, Antonello Venditti’s ‘Roma Capoccia’; Mastantuono’s lilting mandolin, underpinned by tinkling ivories, lends a folksy quality to the tune. The rest of the suite is more along Genesis-influenced, classic symphonic prog lines, with clean-sounding guitar and broad keyboard sweeps, and excellent vocals by Milton Damia – who gets another chance to show his considerable chops in the following song, the atmospheric, sax-infused, blues-tinged ballad Vento Dell’Est, which reminded me of songs in a similar vein by bands like Colosseum-II. The instrumental Roma Dei Misteri, somewhat dark in tone as the title suggests, opens with faint mandolin strains, then turns into a pulsing synth riff lifted out of Rush’s ‘Subdivisions’, while the short Imperium, featuring Ian Mosley on drums, is a heavier, synth- and guitar-driven piece with a solemn, church-like introduction. On the other hand, the neo-prog influence shines through in the romantic, keyboard-led mid-tempos Testimone la Luna and Questo Folle Girotondo. As a whole, “Lady Roma” is a classy package, further enhanced by Milton Damia’s stunning vocal performance. He is definitely a singer that deserves much more exposure, combining as he does the best of the Italian and English singing traditions. It is to be hoped that Corrado Sardella will try his best to keep this group of top-notch musicians together for his next recording efforts. Conclusion. Fans of classic symphonic prog, as well as neo-prog, will not fail to appreciate such a well-rounded, well-crafted effort as “Lady Roma”. Even though the album does not offer any really ground-breaking ideas, it is nonetheless a very enjoyable listen, executed in flawless fashion by some very accomplished musicians – a more than fitting tribute to the City by definition. Tanto tuonò che piovve! E pure in abbondanza! La critica principale che è sempre stata fatta alla musica di Corrado Sardella, alias Doracor, è quella riguardante il costante utilizzo della batteria elettronica. Al settimo album, il tastierista romano si è finalmente deciso a ricorrere allo strumento vero ed ha chiamato ben tre drummers per “porre rimedio”. Il più attivo è Davide Guidoni, ex Taproban, ma spicca la comparsata del marillioniano Ian Mosley sul brano Imperium. La nuova opera di Doracor è un chiaro e vivissimo omaggio alla capitale italiana (ed è anche corredata di alcune splendide foto della città nel booklet), al punto che si apre con un testo recitato in romanesco da Daniele Si Nasce. Il resto è la solita garanzia: rock sinfonico di buona fattura, costruito egregiamente ed eseguito alla perfezione, con le tastiere ovviamente in primo piano, pronte ad indirizzare il sound verso elementi di musica classica, verso aperture melodiche, verso atmosfere sognanti, a lanciarsi in infuocati solos, ma anche a dividere la scena, nei frangenti più energici, con la chitarra di Milton Damia (autore tra l’altro di una convincente prova vocale). Non mancano intriganti inserimenti di violino e di sax a rendere più elegante il tutto. E la discografia di Doracor si arricchisce così con questa nuova valida prova, non distante dai migliori standard qualitativi raggiunti con Transizione ed Onirika.